Gather a group of social entrepreneurs to brainstorm ideas to improve employment opportunities for people with disabilities, and you will harvest an array of innovative solutions. Share these ideas during a vibrant conversation with the number one champion in the Senate for people with disabilities, and you can count on a disability rights advocate who is prepared to mobilize support and resources to promote policies that will create an employment environment in which these cool innovations remain inspirational but become unremarkable. 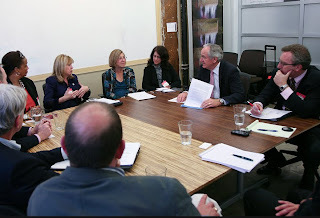 Recently, I had the pleasure to host Senator Tom Harkin (D-IA) for exactly such a meeting of minds with ten fellow social entrepreneurs. I’m happy finally to get an opportunity to reflect here on that important event. Senator Harkin is a longtime advocate for people with disabilities. His signature legislative achievement is the Americans with Disabilities Act (ADA) of 1990. This landmark federal law, known as the “Emancipation Proclamation for people with disabilities,” has been remarkably successful in protecting the rights of people with disabilities. The ADA prohibits discrimination and mandates that Americans be accorded equality in access to employment, goods, services, and other opportunities. 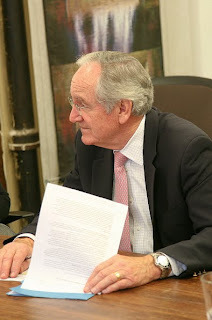 In his current roles as Chairman of the Senate Health, Education, Labor, and Pensions (HELP) Committee and as Chairman of the Appropriations panel that funds education initiatives, Harkin continues to fight for policies that promote equal opportunity, full participation, independent living, and economic self-sufficiency for people with disabilities and their families. Harkin’s work, especially his efforts to guarantee that every child has the opportunity to pursue quality education, infuses everything we at Benetech do through our Literacy Program to transform the lives and outcomes of individuals with disabilities. We applaud Senator Harkin for his ardent support of these people, and are proud to join him in the efforts to break down barriers to equality and to expand the educational and vocational prospects for all Americans. The ADA and the special education laws have produced the best-educated population of people with disabilities in U.S. history, but the work ensuring equality of opportunity is far from over. Now that the Bureau of Labor Statistics reports regularly on the employment situation for people with disabilities, there is strong evidence that it has gotten disproportionately worse for workers with disabilities since 2009. Last year, several HELP Committee hearings revealed alarming facts about the fate of people with disabilities in the face of the lingering recession: more than two thirds of Americans with disabilities are without a job, and adults with disabilities have been leaving the labor force at a rate more than 10 times the rate of adults without disabilities. This disturbing trend has a huge budgetary and social cost in our deficit-ridden climate, as manifested in the increase in applications for Social Security Disability Insurance benefits. And, of course, the enormous toll on the mental and emotional health of people with disabilities is hard to quantify. One of Senator Harkin’s top priorities is making a real impact on disability employment numbers. In his April 2011 keynote address at the U.S. Chamber of Commerce’s Corporate Disability Employment Summit, Harkin called on the CEOs and business owners in the audience to join him in setting the goal of increasing the number of Americans with disabilities in the workforce from 4.9 million to 6 million by 2015. To meet this goal, Harkin has created and supported the Office of Disability Employment Policy to help eliminate barriers across the federal government to the training and employment of individuals with disabilities; pushed to strengthen the services provided to transition-age youth and young adults with disabilities as part of the Workforce Investment Act so that they have an opportunity to work in integrated settings at competitive wages as they enter the workforce; and funded a disability employment initiative at the Department of Labor which will support more effective approaches to delivering employment and training services to individuals with disabilities through the federal workforce development system. Harkin is also seeking collaborations with business and social enterprise leaders to ensure that federal policymaking is producing real results on the ground in the form of jobs for people with disabilities. In connection with Harkin’s visit at the World Institute on Disability at the Ed Roberts Campus in Berkeley, I was given a challenge: bring together a group of social entrepreneurs for a conversation with Harkin, in order to identify novel strategies to improve employment opportunities for people with Disabilities. This is not quite Benetech’s area of expertise, but I took up to the challenge. We hosted Harkin and ten fellow social entrepreneurs at the cool space of the Hub SoMa, in the heart of San Francisco. An amazing conversation ensued, in which Senator Harkin was highly engaged. The meeting reinforced the power of the holistic approach to solving problems: we reaped a lot more great ideas as a group than we would have through individual discussions with the Senator. As example, one strong idea that came up was having staffing services and temp agencies establish benchmarks for hiring workers with disabilities. In this context, we also learned of the importance of temp agencies: it turns out that they have become one of the primary ways to embark on a career path for all people, and that this gateway to employment is especially powerful in Silicon Valley and is spreading to other areas. Since passage of the ADA and the special education laws, we have broken down barriers, created opportunities, and transformed lives. But there is a lot more to do to ensure economic justice for all Americans. If businesses, social enterprises, the disability community, and bipartisan champions in Congress all come together, we can make it possible for many more Americans with disabilities to experience the economic self-sufficiency that comes with employment.